To the public, Diarmid Doody is seen as the ‘Simon King’ of Wales; a well-regarded naturalist, bird of prey expert, wildlife cameraman and presenter of over twenty-four wildlife programmes to date, as well as a renowned wildlife artist specialising in red kites, tigers and snow leopards. Diarmid demonstrates in public regularly and is available to attend events of all kinds (with a display of art if required) where he draws plenty of attention as he works on some of the larger and more dramatic pieces of work. Fee depends on the venue. 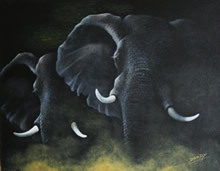 Diarmid also gives talks based on his world of wildlife painting and filming. The evening is an entertaining mixture of talk, film and art! Although not Welsh, he has presented a number of series in Wales about the birds and wildlife of this wonderful area. He can offer an evening of wildlife films, as well as talks, from his long-running series ‘Birdwatcher’ and ‘Wild about Wales’. He also brings along a good collection of wildlife art.